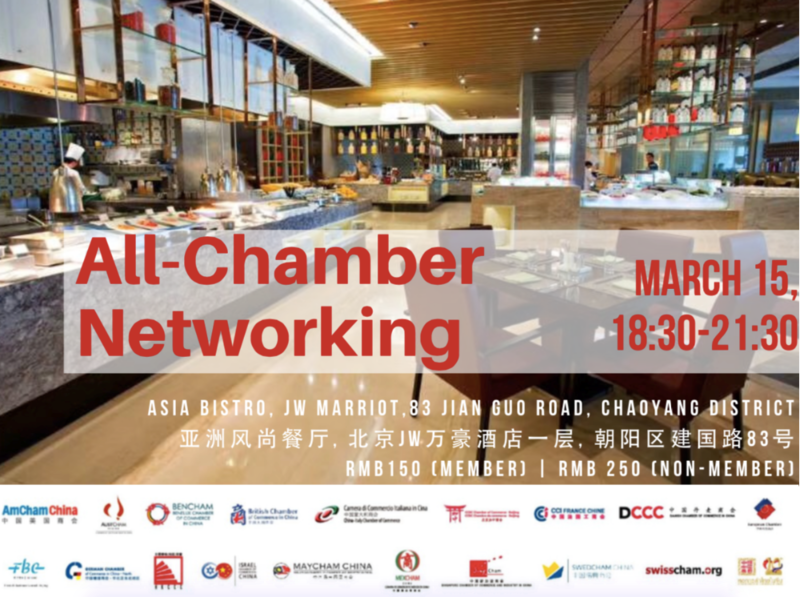 The China-Italy Chamber of Commerce in cooperation with other 14 leading foreign Chambers in Beijing is delighted to invite you to the All-Chamber Networking. The Chambers encourage you to bring friends and colleagues and to forward this invitation to your business partners. It is a great opportunity to network, exchange contacts and meet Chamber staff to learn more about the Chambers` services and activities. American Chamber of Commerce, Australian Chamber of Commerce, Benelux Chamber of Commerce, British Chamber of Commerce, Canadian Chamber of Commerce, European Union Chamber of Commerce, French Chamber of Commerce and Industry, German Chamber of Commerce - North China, Hong Kong Chamber of Commerce in China, Israel Chamber of Commerce in China, Malaysia Chamber of Commerce, Singapore Chamber of Commerce and Industry, Swedish Chamber of Commerce, Swiss Chamber of Commerce. Please send an email to bj.events@cameraitacina.com or click here to register by 14th of March. Members: RMB 150 Non-Members: RMB 250 The price includes four canapés, one soft drink and one beer.